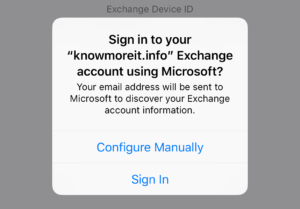 It would appear that not only Microsoft wants to force everyone to use their Office 365 environment for Exchange, but now Apple does too. During our initial testing we have found that the devices are not even checking the autodiscover records. We have ran wireshark on multiple servers and across multiple environments and never see the packets arrive at the Exchange environments, but testing with iOS 10.x there is no problem and the devices pick up the server names and configure automatically. At this time we have tested up to iOS 11.0.3 which was released on 2017/10/11. As new versions comes out we will continue to update this article until Apple is able to resolve the issue.